Swedish Media Coverage: Will Saab be Allowed to Continue its Restructuring? FYI, insightful media coverage from Sweden. Monday, April 6 will mark the midway point in the Saab reorganization allowed under Swedish law after 6 weeks since the February 20 start — prompting media coverage such as below. If all goes according to plan, the reorganization will run until the end of May and can be extended beyond that if need be. Vänersborg is close to Trollhättan… More to come. The restructuring of Saab Automobile, owned by General Motors, has lasted for almost six weeks. It has been a time of setbacks and negative headlines in media. Collapsing sales figures, job cuts, reduced operating time and no government loan guarantees. One relief is that Saab has not needed to pay the wages, since the company has been permitted the governments wage guarantee. So far has the county administrative board paid out SEK 217 million including employee benefits to the 4000 employees. That is money tax payers will lose if Saab goes bankrupt. If the restructuring succeeds will the money be paid back. Thus the Swedish state is one of all 1300 creditors who can question the viability of Saab when the creditors’ meetings are held on Monday. The district court decides if the plan for restructuring holds. The creditors’ meeting will be held at the session chamber of the municipal council in Vänersborg, since the interest from media and employees is believed to be massive. Up to three judges could participate. District court judge Cecilia Tisell is one of them. – There has to be a viable business concept. The proposal has to be persistent and realistic. The creditors’ views are important, she says to news agency TT. According to Swedish law shall the restructuring end if the official trustee or a creditor asks for it and “the objective with the restructuring is not considered to be reached”. If the restructuring is stopped, then Saab is left with all the debts and there ought to be few other outs than a bankruptcy. – That does not have to be decided the same day. The district court could announce that later, says Cecilia Tisell. The task of restructuring has been carried out by the official trustee, lawyer Guy Lofalk, in cooperation with CEO Jan Åke Jonsson. They have had the assistance of two international experts, Stephen J Taylor and Martin Brindley. It is since earlier known that in the new business plan will Saab bring home all its production to the auto plant in Trollhättan. Costs will be reduced by cutting 750 jobs. The question is if that is enough. There is also hope for a new owner with much money. Posted in News from Saab Corporate | Comments Off on Swedish Media Coverage: Will Saab be Allowed to Continue its Restructuring? GENEVA, Switzerland — Saab, the money-losing Swedish automaker General Motors has said it must sell or put into bankruptcy by the end of the year, has had contacts from several potential buyers, company Managing Director Jan Ake Jonsson said in an interview at the Geneva Auto Show Tuesday. Jonsson is confident the Swedish government will provide the money Saab needs to reorganize and find a new owner. Under Swedish law, Saab’s reorganization must be completed by May 20. Jonsson said he expects to have a clear idea who the serious bidders are within a couple of weeks. About half the current potential buyers are involved in the auto industry. Saab’s small size will pose challenges for it to develop new vehicles and technologies alone. Jonsson expects to address that by working with a number of automakers. We could be looking at a Chinese automaker looking for a global dealer network” as Saab’s next owner, Lindland said. The company is going ahead with development and sales plans for its upcoming 9-5 sport sedan and 9-4X luxury crossover, Jonsson said, adding that GM will build the 9-4X at an assembly plant in Mexico. The 9-5 is to go on sale late this year, the 9-4X in September 2010. GM had planned to build the 9-5 in Ruesselsheim, Germany. Production will now move to Saab’s plant in Trollhattan, Sweden. Saab introduced its new 9-3X crossover wagon at the Geneva show Tuesday. The car is to go on sale in the United States in September. Once Saab is separated from GM, the company will redefine its image with a sharper focus on traditional Saab characteristics like safety and small, efficient engines, he said. “There will be a lot of people cheering the day we become independent,” he said of Swedish sentiment for Saab. GENEVA – Swedish carmaker Saab is hoping to find a new investor within three months, promising profitability even with a volume of as little as 150,000 vehicles sold, its chief executive told Reuters in an interview. Thanks to reallocating production of its 9-5 model sedan to Trollhattan, its plant should be utilized much more efficiently and far from cutting jobs, Jan Ake Jonsson expects to add jobs in Sweden, where salary and wage costs are very competitive. “In the next few days we will go out more actively and present our case to the ones (potential investors) who have been showing an interest as well as looking for new alternatives, scan the market,” he said on the sidelines of the Geneva auto show. Jonsson said potential investors in Saab were from both inside and outside the car industry. He is working to find an ownership solution for Saab before the three-month reorganization deadline expires. He said this time period would not necessarily include time for due diligence, and that the deadline could be extended on a three-month basis for up to one year. “We need to accelerate this issue, and I have good hopes we will find interested investors,” Jonsson said. “If you are fully financed through the government and through GM, it’s a manageable size business so I think it’s easier probably to find a buyer for us than any of the bigger companies,” he said. With Saab slated for sale and asking for state aid to survive, Jonsson’s business plan will be key if the Swedish carmaker wants to secure a future in a rapidly shrinking market. Jonsson said part of the problem has been the enormous manufacturing complexity of the current 9-5 sedan, which has been in the market for more than 10 years. He said next year’s relaunch could go a long way to improving margins and boosting Trollhattan’s extremely low utilization rate of less than 50 percent. “The 9-5 (model) and the future 9-3 (model) are engineered to be manufactured in a much more efficient way. If you take today’s 9-5, it goes back a couple of architectures from a GM point of view — back to probably the end of the 80s,” he said. Since Saab generates two-thirds of its sales in the U.S., UK and Swedish markets, he said it was “critical” to expand shares in European premium segment markets such as Germany, where he believes volumes could rise to 15,000 from a current 4,000. Jonsson said Saab’s ties to GM will not be entirely cut, though, since it will go ahead with plans to build the 9-4x crossover in a GM plant in Mexico. GENEVA — General Motors Corp.’s flagging Saab division will accelerate talks this week with “a number” of potential buyers, the unit’s top executive said Monday. Saab Managing Director Jan Ake Jonsson, in an interview at the Geneva auto show, said Saab is working with Deutsche Bank and has begun discussions with potential investors from the auto industry and outside it. He declined to name any of Saab’s suitors, but said it is possible a deal could be completed by next year. Mr. Jonsson also said Saab needs €500 million ($628.8 million) in aid from the Swedish government to survive amid the deep downturn in global auto sales. Saab recently sought to reorganize under court protection in Sweden, a process similar to Chapter 11 bankruptcy protection in the U.S. The reorganization was prompted by GM’s decision to turn Saab into an independent company. Saab will be challenged to survive on its own, however. GM and Saab have asked the Swedish government for financial aid, but the request hasn’t yet been granted. Without aid, Saab could run out of money, Mr. Jonsson acknowledged. Mr. Jonsson added he is confident Saab can attract government support thanks to its importance to Sweden’s economy. Saab and its suppliers employ 15,000 people in Sweden, and it has more than 1,000 dealers world-wide. Saab is committed to reaching profitability by 2011, Mr. Jonsson said. That commitment is at the core of its discussions with the Swedish government concerning the need for loans to keep it afloat. “The Saab brand at this point is very relevant,” he said. Saab’s vehicles are known to be fuel-efficient and sporty, a combination that appeals to certain consumers in the U.S. and Europe. Its sales fell to fewer than 100,000 vehicles in 2008, down from a peak of 130,000 in 2006, mainly because it has only had three vehicles in its lineup and GM hasn’t updated its main models. The Saab 9-5 sedan has been on the market for 12 years and the 9-3 sedan for seven. Saab is minor in GM’s international operations. But it is symbolic of the strategy that GM Chief Executive Rick Wagoner is being forced to abandon as he lobbies for tens of billions of dollars in government aid in the U.S., Canada and Europe. GM’s large stable of brands, long criticized as bloated by outsiders, was supposed to help the auto maker cast a wide net over various types of buyers in the industry. But that approach was costly and complex. In an interview Friday, GM Chief Operating Officer Fritz Henderson said GM was “on the cusp” of launching new Saab models, but then the company’s “revenue collapsed” when auto sales fell dramatically in the second half of 2008. Saab is using the Geneva auto show as the venue to unveil a new all-wheel-drive wagon variant of its 9-3. The unit is also poised to launch a redesigned 9-5 sedan and debut the 9-4X crossover in the coming year. Mr. Jonsson said Saab is working to reassure potential customers. “We’re not naive in terms of believing that what has happened in the past couple weeks has not impacted customers’ judgment,” he said. Technically under Swedish law, Saab needs to be reorganized by May 20, but it is allowed to file for delays of up to a year. In true fashion, Erik rolls on and on and on… For more downloadable images, see media.saab.com under the global tab. Erik ‘Mr Saab’ Carlsson is 80 years young this week (March 5) and still employed by Saab, making him the Swedish manufacturer’s longest-serving employee. As international rallying’s first real superstar, Erik’s career with Saab spans six decades and today he remains actively involved as an international ambassador for the brand, attending Saab launches, dealer and customer events around the world. The names of Carlsson and Saab are inextricably bound together. Born and bred in Saab’s home town of Trollhättan, Erik first sprang to fame in the early Sixties, as ‘the big man in a little car’, taking two back-to-back victories in the Monte Carlo Rally (1962-63) and a hat-trick of wins in the British RAC Rally (1960-62). His ‘David and Goliath’ exploits against more powerful cars were the springboard for launching Saab as a global car brand. He currently drives a Saab 9-3 Aero SportCombi and, in celebration of his 80th birthday, Saab Switzerland is launching an uprated ‘Erik Carlsson’ edition of the 9-3 SportCombi and Sport Sedan, both featuring Saab’s widely-acclaimed XWD, all-wheel-drive system. Erik will enjoy his birthday at home with close family and friends. And on Saturday, March 14, he will attend a special Open Day at the Saab Car Museum in Trollhättan to be held in his honor. You’ve always known us as somewhat of an unconventional company. From our very first days, when a group of unassuming jet engineers decided that driving should feel more like flying, we’ve had a natural affinity to seek the not-so-obvious path. Buoyed by a curious mix of ingenuity and optimism, we’ve always found our way. Today, our sights are set on a new destination: independence. Last week, General Motors submitted its viability plan to the U.S. Department of Treasury that outlined the corporation’s long-term restructuring goals. In that plan, GM stated that it would actively pursue measures that could result in Saab Automobile AB, including all of Saab’s global operations, becoming an independent company. Saab has had several different types of ownership during its storied history. Recently, the first step toward re-establishing its independence was taken when Saab Automobile AB in Sweden filed for reorganization under a self-managed Swedish court process that will attempt to create a fully independent business entity. The reorganization in Sweden allows Saab to continue operating, while new ownership possibilities are being pursued. Current business is unaffected during this restructuring process. To current Saab owners and loyalists, be assured that all warranties on Saab vehicles remain valid. The warranty for both new and Certified Pre-Owned Saab vehicles are provided by GM and remain intact. GM will support continued availability of parts and service. Prepaid scheduled maintenance also remains in effect on all current product offerings. To those who have recently expressed interest in buying a new Saab, we’ll be there for you as well. 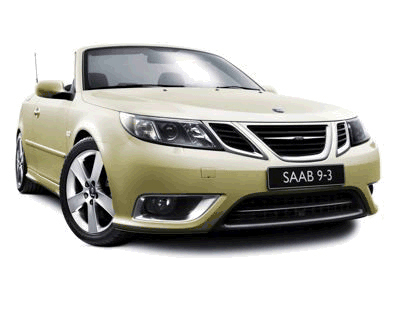 All of Saab’s current product offerings remain available. While these times may seem turbulent and uncertain, our cars are just as safe, just as fuel-efficient and just as fun-to-drive as ever. With the full backing of all warranties, you can drive with confidence knowing that your Saab will be covered under its warranty. We are excited by the potential opportunities tomorrow will bring. And we’re eager to start anew. During the reorganization period, your Saab Dealer stands ready to assist you with all your sales and service needs. In addition, Saab Customer Assistance is available at (800) 955-9007. While it may not be the most conventional path to take, for those who know Saab, you’re well aware – we know no other way. With the spirit of Saab leading us, we hope you’ll join us for the ride. DETROIT – At the Geneva motor show in March, Saab will introduce the 9-3X — a new addition to the 9-3 range, becoming available in the 2010 Model Year. The sporty 9-3X was designed for people with active lifestyles who don’t want a large Crossover or SUV. The Saab 9-3X is a rugged all-round car designed to take active individualists to the start of their adventure. With distinctive looks, a versatile SportCombi body, higher stance and advanced all-wheel drive technology, the 9-3X offers fuel efficiency and functional storage without limiting the kinds of roads that need to be driven. In the 9-3X, the acclaimed Saab Cross Wheel Drive (XWD) system – which made its debut in the Turbo X limited edition model last year – will be combined with the fuel-efficient 2.0-liter turbocharged four-cylinder gasoline engine. Overall, the 9-3X embodies Saab’s “EcoPower” technology philosophy, which aims at combining a dynamic driving experience with an efficient use of resources to achieve responsible performance. Saab designers raised the chassis of the two-wheel drive 9-3 SportCombi 35 mm (1.4 inches) higher, so the 9-3X can handle a rugged driving terrain. It is specifically designed for those who frequently hit gravel or unpaved roads, without compromising the driving experience on asphalt. New front and rear bumpers feature a dark gray, grained finish that is also applied to the side sills and the edges of the wheel arches as a protective covering when the terrain becomes loose or muddy. This treatment is complemented by skid panels with a matt aluminum finish, curving up towards the door opening at the rear and adopting a wing form in the lip of the lower front bumper. These are matched by matte, aluminum-colored lower door decor strips. Roof rails and visible, twin round exhaust tailpipes are standard. Front fog lights ringed with a chrome finish add yet another bold accent. With the addition of newly designed, multi-spoke 17-inch alloy wheels, the 9-3X’s exterior character reflects its ability to handle mixed road conditions, whether rough or smooth, loose or paved. Inside, the 9-3X interior is based on top-of-the-line specification, adding a dark metallic finish to the door trims, glove box and gearshift surround. The hardware includes an electronically-controlled Torque Transfer Device (TTD), which varies power delivery between the axles. A valve increases or reduces hydraulic pressure on wet clutch plates inside the TTD to progressively engage or disengage the rear axle. The degree of ‘slip’ dictates how much drive is transmitted to the rear wheels. A standard rear limited slip differential (eLSD) operates on the same principle, splitting drive across the axle to whichever wheel has more grip. As part of the Swedish-manufacturer’s rightsizing strategy, the 9-3X will come to the U.S. with Saab’s hallmark 2.0-liter gasoline turbocharged four-cylinder powertrain, offering 210 horsepower. Complementing the sporty exterior styling, the engine is mated with a six-speed manual or automatic transmission. The 9-3X is also designed to make loading sports and leisure equipment easy, matching form with function. The rear cargo area, with a low floor, is surprisingly spacious and well-proportioned. The compact design of the rear suspension allows a deep box-like space, free from intrusions, offering a useful rear seat up/down volume of 29.7/72.3 cubic feet . The 60/40 split rear seat-back incorporates a ski-hatch and folds down without any need to move the fixed seat cushion. The fold-down front passenger seat-back also makes it possible to carry items that are as long as 8 feet. The fully carpeted rear load space is illuminated by two interior lights mounted on the inside of the D-pillars. It is accessed by a lightly-weighted tailgate that opens down to bumper level, its damper rods completely hidden in the roof to allow a clear, uncluttered opening. The flush-fitted, black molded floor plate has been designed to stay scratch-free even in heavy use. The TwinFloor stowage facility, too, helps keep luggage and equipment safe and tidy. The middle section of the floor hinges upwards transversely when the handle is pulled so that the front edge fits into two retaining slots. There is also a 12-volt power socket in the main load area (for a hot or cool box) and a separate storage compartment at either side of the floor, one fitted with a molded holder for large bottles. Saab is a division of General Motors Corp. Saab Automobile USA is the importer and/or distributor of the Saab 9-3, 9-5 and 9-7X for Saab Automobile AB, Sweden. For the 2009 model year, Saab offers 7 different models that deliver 27 mpg or better according to EPA Highway fuel economy standards. In addition to 4 years/50,000 miles bumper-to-bumper warranty, including roadside assistance and courtesy transportation, every new Saab comes with 3 years/36,000 miles no-charge scheduled maintenance plus standard OnStar and XM Satellite Radio. Visit www.saabusa.com for more information. Burn Notice, the number one new show on cable, returns for season 2.5 with all new episodes starting Tonight- January 22nd at 10PM EST on the USA network. The Saab 9-3 Aero Convertible will play the lead role as Fiona’s (Gabrielle Anwar) vehicle and will be featured in all 7 episodes. In addition, Saab will have spots running during each of these episodes. The 9-3 Aero Convertible will also play an integral part in Covert Ops 2, the online Alternate Reality Experience that puts the user in position of aiding Michael Westen in weekly missions. You are currently browsing the archives for the News from Saab Corporate category.